Last Saturday I travelled to Hereford to meet up with bride-to-be Jennie. This sporty young lady and self-confessed tomboy was staying at the lovely Marsh House Farm B&B and campsite. Jen, her bridesmaids, family and friends were camping on-site in tents and caravans. It transpired Jen was up socialising until the wee hours so was still in her caravan bed when I arrived! The marquee was up and being decorated and I had a wander around the beautiful grounds of Marsh House Farm. Jen and Brendan had told me previously they wanted a low-key, relaxed wedding with few formalities. Apparently Jennie is rarely seen in a dress and doesn’t usually wear make-up. Her lovely sister Fiona and close friends Lotte and Sarah therefore set to work on her! Jennie’s Uncle and Aunt had brought their beautiful vintage Triumph Stag to take Jennie to Hereford Registry Office. I watched them as they set about adding ribbons and a wicker heart to the car. It was soon transformed into a stunning wedding vehicle suitable for a gorgeous bride! The entire campsite was occupied by people attending or involved with the wedding. There was a lovely atmosphere as most people knew each other. Bride Married by her own Mum! 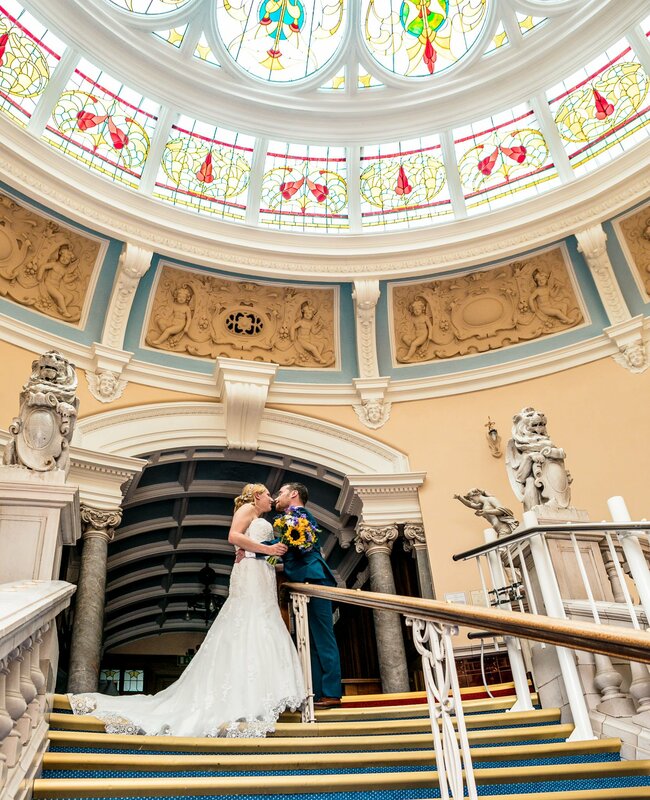 We set off for the Hereford Town Hall … a beautiful older building with amazing features. I met Brendan and his best man Matt nervously waiting for his bride-to-be. 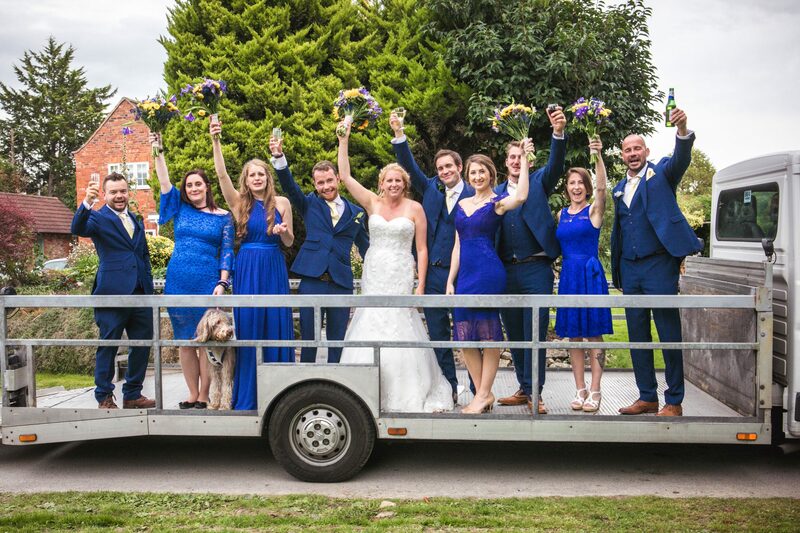 This wedding was to be quite exceptional as Jennie was to be married by her own mum! Mary is a qualified Registrar and normally conducts ceremonies where she lives in Surrey. Jen sadly lost her dad two years ago so was walked down the aisle by her brother Pete and dad’s best friend Phil. It was a real honour to be able to watch such a lovely ceremony. This was the first time I’ve ever seen a bride married by her own mother! I’m not sure how Mary kept it together … I’m sure I would have been far too emotional if it was me! After the legalities, we all headed back to Marsh House Farm. Jen & Brendan had organised The Wandering Pizza Company which soon started churning out an endless supply of delicious pizzas! The grounds were fabulous for photos as also has a small lake containing beautiful water lilies. After everyone had eaten, speeches were conducted by Brendan, best man Matt, Jen’s brother Pete and ‘substitute dad’ Phil. There was bunting, fairy lights, conker-playing and children loving the relxed atmosphere. The band Catch 22 soon arrived to start setting up in preparation for the evening guests arriving. As the evening wore on and the dancing started, a big curry was brought into the marquee. After the cutting of the cake and first dance, I left the happy couple to enjoy dancing the night away.